All welded steel construction delivers years of dependable service with no assembly. Supports loads up to 1000 lbs. Single shelf model with open style cross-arm base serves as a workbench where seating is required. 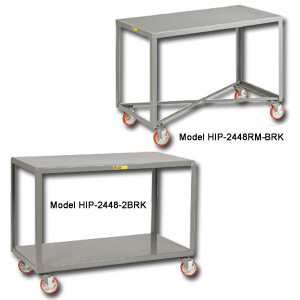 2 shelf models provides for additional storage or transport capacity. Tables stand 34"H. Rolls on 4 swivel casters for increased mobility and 5" non-marking polyurethane wheels with ball bearings and wheel brakes. FOB Shipping Point. Product No. Size W x D Wt. (lbs) Price Ea. No. Size W x D Wt.